Join beloved teacher and aspiring foodie Margaret Feinberg on a pilgrimage to discover the secrets to savoring every day. In this global culinary and spiritual adventure, you'll cast nets in the Sea of Galilee, descend 410 feet into a salt mine, bake matzo at Yale University, harvest olives in Croatia, study with a Texas butcher, and visit a premier fig farm. "This journey changed my life, my faith, my future, " Margaret writes. "It moved me from fear and uncertainty to discover a vibrant faith again - I believe it will do the same for you." With delightful curiosity and whimsical humor, you'll learn to nurture deeper connections around any table and discover the satisfying, fruitful life you've been created for. This is an invitation to taste and see God's goodness, and there's a place set just for you. Margaret Feinberg's appetite for the feast of His grace makes you hunger for more of a fulfilling life. Read and taste the richest food for the soul! - Ann Voskamp, author of New York Times bestseller One Thousand Gifts. Taste and See is part cookbook, part Bible study, and part biography. 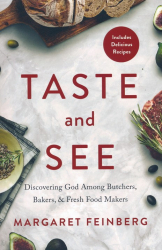 My friend Margaret takes you on an inspiring journey to discover there is more to biblical foods than meets the eye. Believe me - you will love this book. - Phil Waldrep, founder of Women of Joy Conferences. I could not put it down! I lost track of time like reading an adventure novel, when in fact she is writing a factual and biblical documentary. Impressive! I'm the least foodie man on the planet, and yet I loved Taste and See. - Shane Farmer, lead pastor of Cherry Hills Community Church, Denver, CO.